Added by Indo American News on November 13, 2015. He immigrated to the United States in 1969, arriving with his wife, two sons, fifty dollars, and a dream. He attended the Bowling Green State University where he received his Master’s and Doctorate degrees. He had a strong love for his alma mater and he never forgot the kindness and generosity of each person who believed in him and helped him succeed. Dr. Chopra’s career in education spanned over 50 years. He was a teacher, an assistant principal, a principal and he served as Superintendent of Schools in six states: Ohio, Iowa, Kansas, Texas, Pennsylvania, and Arizona. 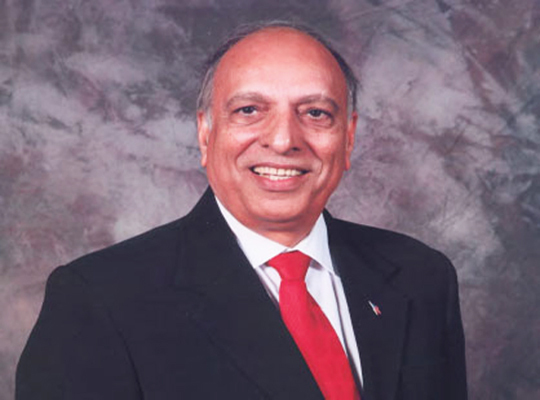 He was the Superintendent of the Fort Bend ISD from August 1991 to July 1994 and at that was the highest ranked Indo-American public official in the Metroplex. He was known as an administrator who placed the interests of the students in the forefront when decisions were made. He truly believed that all children could learn and deserved the best from those who served them. Dr. Chopra’s balance of work came through his love of family. He was the rock, the patriarch that held the family together. He was dad to three children of whom he was very proud and was the doting grandfather who loved his five grandchildren beyond words. Even at young ages, he shared with them his wisdom for life, his belief in hard work, and his expectation of always giving your best. Although his life was blessed with success, he came from very humble beginnings. In 1947, at the age of ten, he lost his father to cancer and his maternal grandparents to senseless religious violence during the partition of India and Pakistan. His family became refugees as they fled for safety. His life both personally and professionally defied the odds that were stacked against him. He credited two women for his success: his grandmother who instilled in him at a young age the importance of education and believing in yourself; and his wife Sue, of fifty-one years, who was the silent strength behind his voice and the courage behind his endeavors. Dr. Chopra was the life of the party and a vivacious man who lit up a room. His passion for life, his love for education, his keen desire to work hard and succeed, and his love for family and America will remain in his family for generations to come. And he was so proud to be an American.